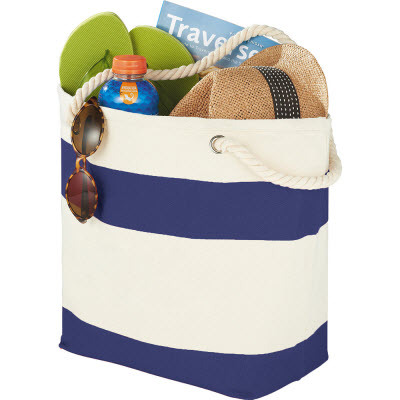 Description: Show your stripes with this sturdy nautical tote, perfect for the beach or getting around on the weekend. Open main compartment. Available in 3 colours. Features: Soft cotton rope handles and graphic silk screen print make this tote stand out. 10 inch handle drop height. No business card holder featured. Packaging: Polybag Colour: Natural and Blue Material: 16oz Cotton Canvas Product Size: 455mm(w) x 336mm(h) x 170mm(d). Freight details : 25 per carton, 9.5kgs, 48 x 37 x 25cms; Decoration Type(s): Colour Print / Embroider / Full Colour Print Decoration Area: Screen: 200mm(w) x 100mm(h) on front in natural panel. Embroidery: Centred on front pocket: 200mm Dia. Other Methods: Contact your decorator for applicability and size.